Hexage’s Everlands HD can best be described as a mix of Chess and Tic Tac Toe—with cartoon animals! Though the game’s graphics are cheesy and invoke memories of preschool cartoons, Everlands is no mere child's play. Instead, Everlands is one of the deepest, most complex strategy boardgames you'll see on the iOS. The arrows indicate in which direction the animals can attack. So that wild boar is sitting pretty right now. The plot of Everlands HD is that an evil force has corrupted much of the animal kingdom and you must help liberate the animals from tyranny. The story is told in storybook form, giving the impression that the game is meant for a younger audience. But the gameplay is advanced and is best enjoyed by adults. The object of Everlands is to occupy the majority of board spaces on a given level. 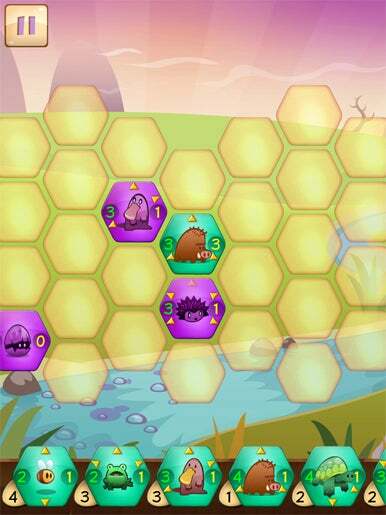 Each turn, you can place one (or in rare cases two) animal-themed hexagonal game pieces. The animal pieces include bears, hedgehogs, elephants, bees, owls, mice, raccoons, beavers, frogs and other members of the animal kingdom. While their icons are adorable, the gameplay is remarkably cerebral. The turn-based game tasks you with conquering a majority of the board spaces by placing your animal units strategically on the board. If you place your animal adjacent to an opponent's, they'll fight and each take damage. If you defeat an enemy animal, it'll come to your side with full health. But the same rules apply for your opponent, so you have to place your animals in positions where they can attack but also defend soundly. Just as a bishop can only move diagonally on a Chessboard, some animals can only attack left or right, diagonally, up or down, or from every angle except right—each animal has small yellow arrows that indicate in which direct in can attack. Animals also have different strengths, indicated by attack and defense numbers on each icon. If you place an animal to the right of its opponent, but your animal can’t attack left, and the opponent can attack right, the opponent has an advantage. However, if the opponent animal has a lower strength than your animal, then it won’t do much damage. Further complicating the formula is the fact that certain animals have special powers. Frogs can heal adjacent friendly units, bears are stronger when wounded, and kiwis can lay eggs which can block your opponent from placing their units in certain spaces. As you only have a limited number of each animal type to use in a given stage, you really have to contemplate animal placement on game boards before setting them down. You don’t want to place only powerful animals on the gameboard too early on in a match, as you won’t be able to use those animals in the match’s later, often more important stages. There is a lot more strategy involved in the game than its simple looks would lead you to believe. You can choose to play against a real person in the game’s “Duel” mode. However, you can only play multiplayer on one iPad, not via wifi or 3G. The iPad turns into a game board for you and a friend to play on. After each match, you can post your game scores on Facebook. The game’s soundtrack isn’t terrible. I wasn’t annoyed by its music, but I still would appreciate it if the game would allow you to use your iTunes music collection instead of its normal composition. While the average gamer may look at Everlands and see the corny animal drawings that litter its background and think "this is a kids' game"—don't be so quick to judge. This is a remarkably deep, challenging, and complex strategy game that should be on any thinking person's iPad.